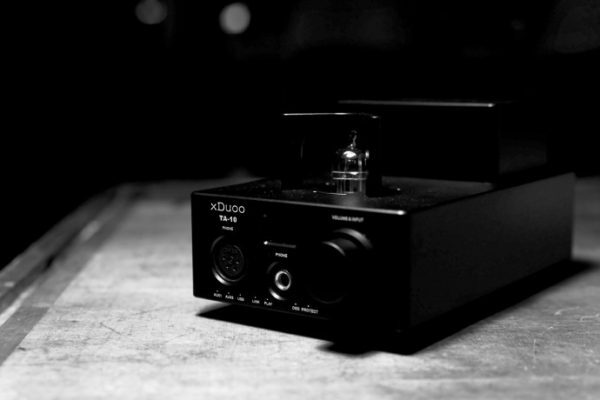 If you have been reading a lot of John Darko’s articles on DAR, or articles/reviews on Audiostream, Stereophile or Computeraudiophile you surely came across the terms „Roon Ready“, „Roon Tested“ or „RAAT“. Roon on first glance is a playback software, like Audirvana+, Foobar2000 or Jriver. But take another closer look and you will find out that is so much more. Roon consists of three parts: the Core, the Remote and the Output. For all three you can download specific software parts. Roon runs on all platforms and Remote can be used with iOS and Android devices as well. It also controls systems like Sonos, Airplay or Devialet Air, all integrated into one software. I myself am using Roon Server (Core + Output) on my OpenSUSE Leap 42.2 machine and use an iPad Air2 as remote. Roon uses its very own transfer protocol called RAAT (Roon Advanced Audio Transport). Which is in some ways similar to UPnP, Airplay or Chromecast. 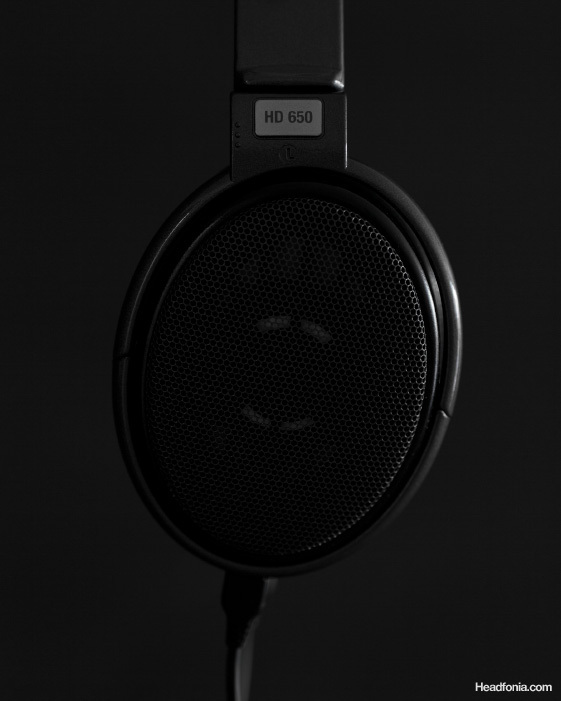 But in contrary to those it has been developed with one major difference: to be perfect for audio. And this is exactly what we are all after. So what exactly now is „Roon Ready“ and „Roon Tested“? 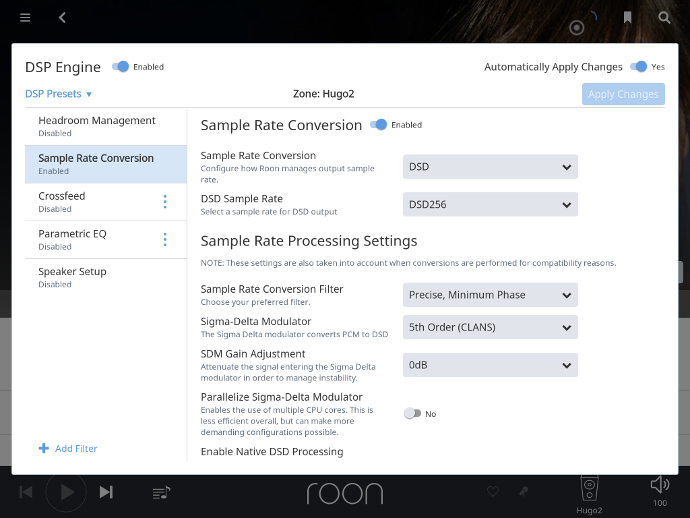 Roon Tested is other hardware (USB DACs) that has been tested by the Roon team directly, this guarantees best support possibilities in the forums and enables Roon to interact fast enough with the users. Hardware partners that have their units tested are also allowed to display their products with a special line art in Remote (Roon’s UI). For example the DragonFly Red from AudioQuest is Roon Tested. Roon has a few advantages to the common playback softwares out there. It not only finds your locally stored content on your harddrive or network attached storage, it also combines it with your TIDAL and Dropbox account, forming one massive storage with your own music and much more. BUT that’s not it, Roon is actually designed to be used for multi-room setups, where you enjoy your music in different rooms at home. You can assign every room the same audio or send different music to each and every room. That has been around for quite some time, but Roon also enables you to tweak everything with its own, extremely powerful DSP functions. 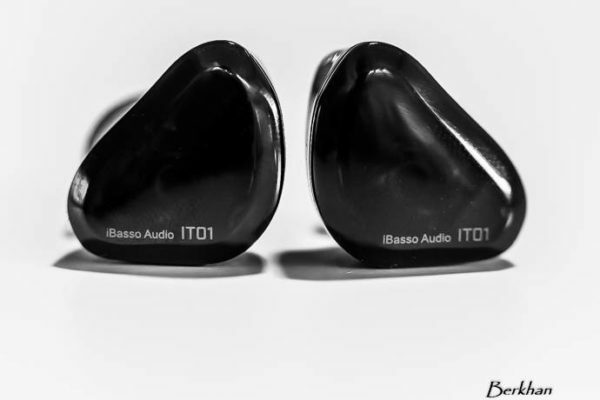 You can even correct speaker volume variations and for us headphone maniacs you get also Crossfeed, headroom management and parametric equalization. This software is packed with features! 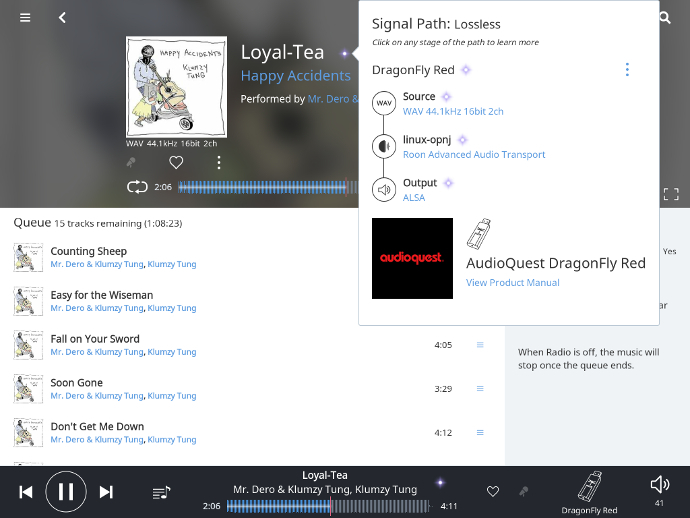 To make everything a little clearer for the listener, Roon gives you the Signal Path. 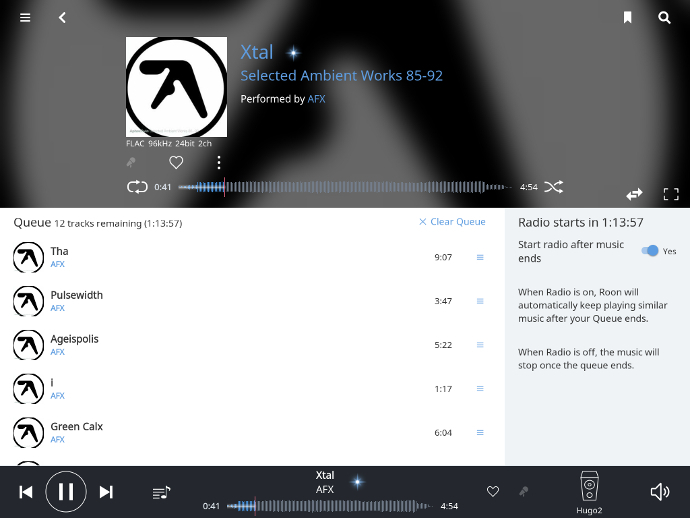 With its color codes it lets you know how you are listening to your music (lossless, lossy). Click on the little dot and Roon will tell you the exact steps of how your file was processed. Manufacturers who partnered with Roon also get the advantage to put their own line artwork in the UI. A link to the user manual is also provided directly in the interface then. Roon recently also announced their brand new hardware project, called Nucleus. In cooperation with Intel they will release two NUC based Roon pure audio servers. They will run only one thing: Roon OS. Roon’s very own Linux based operating system. Both Servers (Nucleus and Nucleus+) are aiming at different places. While the weaker spec‘d Nucleus is perfect for small home installations, Nucleus+ is the one to go if you want to set up a massive multi room audio system. But Roon kindly also gives you the exact hardware requirements to build your very own Nucleus or Nucleus+ for a much cheaper price. They also throw in Roon OS for free to build your own ROCK (Roon Optimized Core Kit)! So all tech-savvy and Linux-affine people should definitely give this one a serious consideration. To make it easy for you, Roon offers a one-click link that adds everything needed to your Amazon shopping cart. Here at Headfonia three of us are using Roon as their primary playback software. Lieven, Nathan and yours truly. We all became instant fans of this long overdue revolution in software. I myself love it because of the intuitive workflow and interface. The fact that it combines all my stored content with my TIDAL account and the easy to use and love GUI. I’ve been using it for about a year now, and I am constantly learning more about this piece of code. The fact that it pulls metadata and artist information (including show dates, bios etc) from all over the internet lets me learn more about my favorite artists and groups, all in the same interface from which I am playing my tracks from. One of the best things about Roon though is its “Roon Radio”, basically it is a dynamic playlist created at the end of your selected tracks. Many softwares can do that, I know, but none so far has delivered a content that is so matching. What I also just recently started using is Roon’s own resampler (in its DSP engine). You can upsample every file to the maximum supported bit-depth and samplerate. I’ve been doing this with my Hugo² (upsampling everything to DSD256), and though I have never been a fan of this kind of deforming, I must say, soundquality definitely benefited here. It gained a lot of blood, body and emotion. Never have I thought to do anything else than bit-perfect playback… Ever since Nucleus was announced I’ve been playing with the thought of building myself my very own ROCK. I haven’t twinkled with hardware in quite a while and this could be the project that could get me back. Don’t believe me? Find out what Lieven and Nathan have to say on the next page. Thanks for your comment, I couldn’t find the info on Roon stating that Chord’s FPGA is superior, it does state that some FPGA based DACs do a better job though. To my ears it sounds better to have it upsampled by Roon first and then handled as DSD by my Hugo2… YMMV of course. Roon is the other hardware (USB DC) tested by the Robin Team, it guarantees the best possible possibilities in the forum and helps speed up fast. There are numerous ways to make your Yahoo Mail account more secure against hacking. One of the best ways to do is enabling two-step verification feature in your Yahoo Mail account. To activate two-step verification feature – Go to the Account security section of your Yahoo Mail account and click on the slider button next to the Two-Step Verification option. Then, follow the on-screen prompts to complete the process. Similarly, if you need tips or assistance for any other query or issue in your Yahoo Mail account, you can get in touch with our Yahoo Mail customer support expert. Our experts are capable of resolving all sorts of Yahoo Mail-related issues. To seek assistance from our experts, feel free to call on our Yahoo Mail customer care number (toll-free). Also, you can contact our experts via email, live chat, and remote assistance option.